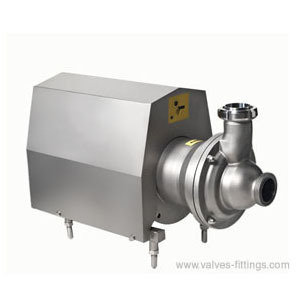 The AVB Series is a self-priming pump specially designed for pumping liquids with entrained air or gas. The pump is widely used in the food, chemical, and pharmaceutical industries. It can also be used for CIP-return. All product contact surfaces are 316L stainless steel with 32Ra finish. Other parts are 304 stainless. Seals are EPDM or silicone. Single or double mechanical seal available. Adapters for AVB-167S, 192S and 203S series are made of cast iron, zinc coated and lacquered to ensure high corrosion resistant. Efficient removal of CIP solution from process equipment. Reduced process and CIP time vs. standard centrifugal pumps. Maximum Suction Height: 8m, 22ft. Motor Type: B35, frequency 50Hz/60Hz. Product wetted: AISI 316L/304, others 304 stainless. Inlet/outlet connections: Clamp, male threaded, flange, DIN, SMS, 3A, RJT.